Seven overs to go and New Zealand need 69 to win. Finn is back for his third over. He has 0-21 from his first two. Williamson is playing so well but he needs better support at the other end. Santner is struggling a little to tick the strike over and/or hit boundaries. Only five from that over. Wood into the attack now. New Zealand need to make a move now. Williamson advances down the wicket first ball and collects two. He then slaps the ball off his pads for a single. Time for Santner to come to the party. WICKET - Santer has been bowled. Santner tried to slog one across the onside but played all around it and Wood knocked his off stump over. 61 now needed from 33 balls. What odds on a Williamson century? would be hilarious! I can't find odds of a Williamson century but NZ are now paying $3.75 to win. 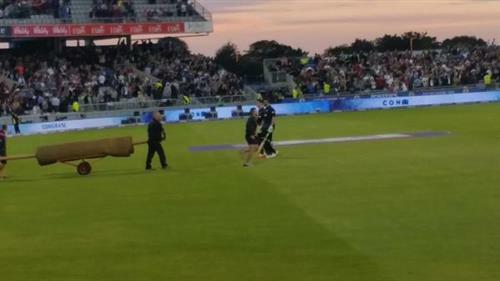 WICKET - Williamson has been run out. McCullum was desperate to get Williamson on striker, a little too desperate. He called a run when after hitting straight to a fielder and a direct hit left Williamson well short. Wicket - Southee is gone first ball. That should just about do it for England. Southee tried to clobber one down the ground but hit it straight to mid off. NZ now need 61 from 30 balls. McCullum has not scored off five balls now. The WASP must be around 2% now. Great over from Finn comes to an end. Just three runs from it. I think it's been a very poor tour of England by the @BLACKCAPS It's about results at this level & NZ have been out played. #Ashes Gameon!! 58 now needed from 24 balls. WICKET - McCullum is gone for 3. He stepped right across onto his offstump and tried to tickle one to fine leg but hit it straight to the fielder. McClenaghan is the last man in for New Zealand. WICKET - McClenaghan is gone first ball and it's all over. Thanks for joining our live coverage this morning. Make sure you stick around for Andrew Alderson's match report which will be online very soon. @BLACKCAPS Once again thanks for a great game. Going to miss you guys now. Are you sure you can't play @englandcricket instead of Australia?